When the Remote app first launched in 2008, it could control your Mac and Apple TV’s music from afar—but that was about it. The program has come a long way in four years: Version 3.0, which launched alongside iTunes 11, gives the whole app a good polish along with a new iPad interface and a few new features that tie in nicely with Apple’s latest desktop media manager. The Remote app retains most of the features you might know and love from version 2.4: You can connect to your iTunes or Apple TV libraries via Home Sharing, control content playback, create and edit playlists, tap into other shared music libraries, trigger the visualizer remotely, and create Genius playlists. 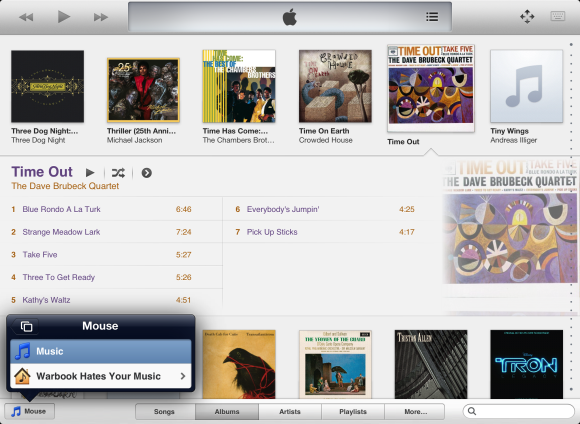 Version 3.0 takes all of those features, adds a few tricks, and incorporates iTunes 11 improvements. From the start, the icons in the Remote library have been updated to reflect iTunes' new silver icon; you’ll also spot colored icons in the iPad version of the app. 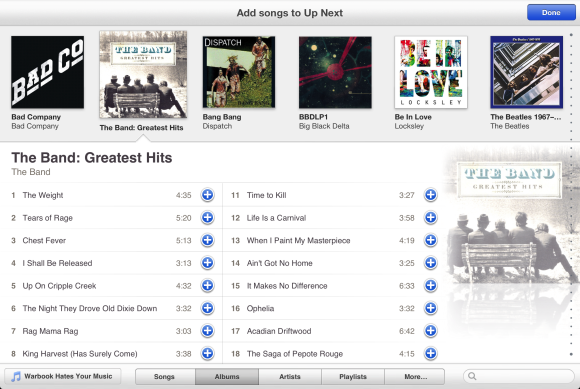 The Remote app’s biggest new feature is support for Up Next, iTunes 11’s live playlist/jukebox. Once you start playing a song from the app (or connect the app to a library already playing music), iTunes generates an Up Next list of songs. You can add to the list or edit it at any time by tapping the Up Next icon and choosing the Add or Edit button, respectively. 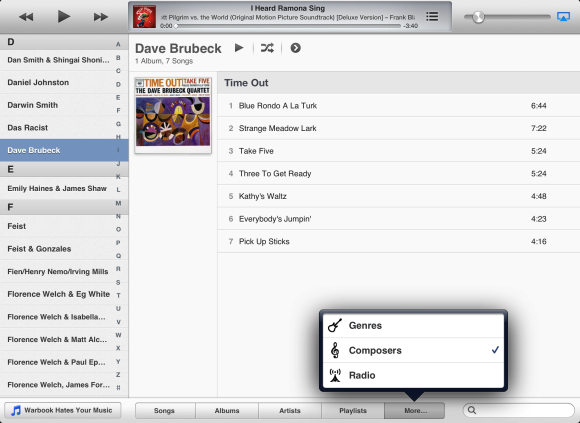 The Up Next icon also holds a button for viewing your listening history, in case you want to hear a certain song again. Tap Add, and you’ll see your library with an 'Add songs to Up Next' label atop it. Select songs by tapping the blue plus button next to them, or tap and hold an album cover to add all of its tracks to your queue. When you’re finished, just tap the Done button. Up Next lets you add songs from anywhere in your music library. Though you’re technically allowed to add playlists to Up Next, I encountered a slew of crashes with the Remote app when I tried to go through the Add routine; even when the app finally let me view them, I was stuck selecting only individual songs from playlists in this mode. Tap and hold any song or album to get this contextual menu. Thankfully, Add mode is not the only way to select new songs for your queue. You can also tap and hold on any song, artist, or album to bring up a pop-up menu with an option for adding it to Up Next. 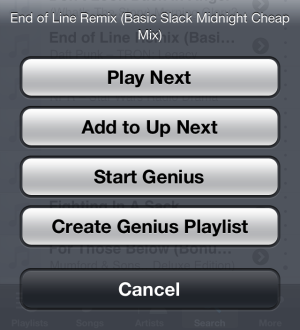 Tap and hold on an individual song, and you can also start Apple’s Genius feature, or create a Genius playlist. And all playlists have arrows at the top allowing you to add the entire playlist to Up Next. Once you’ve added songs, you can edit the list by tapping the Up Next icon and selecting Edit; drag the songs into position as you wish, and tap the delete button for any songs you’d like to eliminate. You can even clear the entire queue, if you don’t see any songs you want to listen to. The settings section of the Remote app sports the program’s two other improvements: You can now sort your music in Songs mode by artist instead of by title, and you can turn on a Stay Connected setting that allows you to keep the link with your library—at the cost of your iPhone or iPad’s battery life. On the iPhone, the Remote app looks largely the same as its predecessor, with a few iTunes 11-inspired interface tweaks. 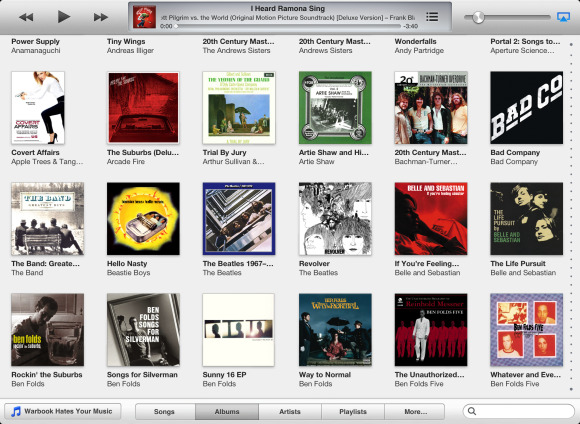 Searches have adopted iTunes’ gray-and-black category labeling, while the track list of the Now Playing screen has become a space for viewing and editing the Up Next queue. On the iPad, however, Apple has completely revamped the app’s interface: Connect to a library or an Apple TV, and you’re greeted with what looks to be an iOS version of iTunes 11. 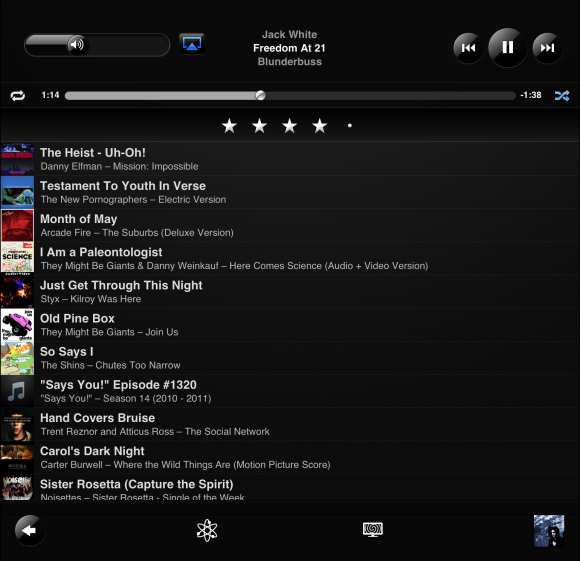 The previous, play/pause, and next controls occupy the top-left corner of the app, with the playhead in the center; controls for volume and AirPlay (if connected to an iTunes library) or a touchpad and keyboard (if connected to an Apple TV) are also present. When a song is playing, the playhead displays the song’s album artwork; a center portion with the title, album, artist, and scrubber; and the Up Next icon (three dots and horizontal lines). You can tap the album artwork within the playhead to enter the app’s full-screen mode, which largely resembles the full-screen mode of the Music app. Remote's full-screen mode looks strangely unfinished; it has the previous version's rating display, but shows Up Next tracks below that. As in the iPhone version of the Remote app, you can tap the old track-listing button to see a list of songs in your Up Next queue—but you'll find no buttons to add new songs, arrange the order of current songs, or delete unwanted ones. Instead, you have to exit full-screen view and tap the Up Next icon to do those things. The iPad’s full-screen mode also appears to be the only place where you can still rate songs from the Remote app—on the iPhone, the rating controls have been replaced with buttons controlling Up Next. It makes me wonder if Apple hadn't completely solidified this view when the Remote app shipped—it’s the only area of the iPad app that feels unfinished. The main area of the Remote app on the iPad is, as always, dedicated to content display. By default you see a list of songs in alphabetical order (though a toggle is available in the Settings portion of the app to sort the list by artist instead); you can also choose to view your songs by album, artist, playlist, genre, or composer. All these views are identical to their iTunes 11 counterparts—including the custom-color sampling behind the tracks of an album. You have no way to turn off the album custom-color sampling in the Remote app—you're stuck with it. Classical-music lovers missing iTunes 11’s Composer sort can still find it in the Remote app; it looks similar to Artist, Playlist, and Genre view, displaying a left sidebar containing all the composers in your library organized alphabetically. 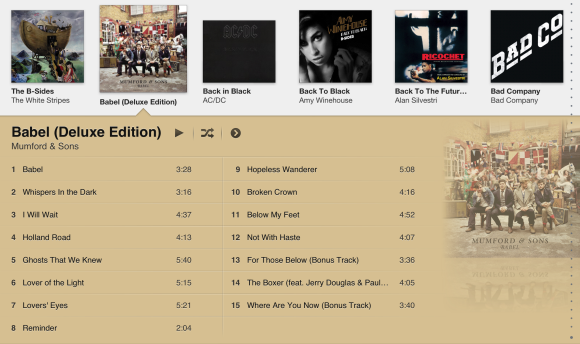 Annoyed because iTunes 11 has no Composers grouping? You can still view it in the Remote app. On the iPhone, all content categories hide within the Remote app’s More button, listing music groupings like Genre next to Music Videos and TV Shows. 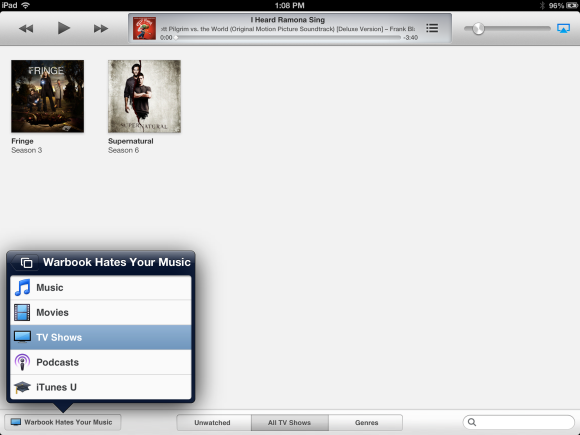 Not so on the iPad, where the More button contains only options for Genre and Composer. To get to your movies, you instead have to tap the Library button in the lower-left corner (it should list the name of the iTunes library or Apple TV that you’re connected to). This action produces a pop-up menu with Music, Movies, TV Shows, Podcasts, and iTunes U options. Tap a category, and the Remote app’s library content and grouping buttons change to reflect it: For instance, tap TV Shows, and the groupings change to Unwatched, All TV Shows, and Genres. Content organization takes a cue from iTunes 11, and hides within the library button. In theory, once you’re logged in to the iTunes Store on your Mac, your purchased TV shows and movies should show up when you view these categories; in practice, I couldn’t get this feature to work on my own devices, but it may just be an iTunes quirk that a few restarts might solve. Although I generally like the revised Remote app quite a bit, it has a few flaws. Genius in particular feels very flaky, and has some crashing problems. (Trying to load the Genius playlist when no song is playing is a good way to crash the app outright.) And Genius Mixes don’t even appear on the iPhone version of the app when you’re viewing an iTunes library; you must either use an iPad or be connected to an Apple TV. You still can't view your Movies, TV Shows, Podcasts, or Radio streams on the Remote app if connected to an Apple TV. Speaking of the Apple TV, Remote still lacks any way to interact with its streamed video content: If you want to use your iPad to tell the Apple TV to play a movie, either you do it entirely through the gesture controller and the Apple TV’s menus, or you stream it via Home Sharing—through your iTunes library’s collection. This arrangement seems needlessly clunky, especially since iTunes 11 is handling a great deal of streamed content these days. Apple’s Remote app is free, making it practically a necessity to download in the first place. But even if it weren’t, the company has done some great work in version 3 that absolutely warrants the upgrade. If you’ve upgraded to iTunes 11 and want to control your music from afar, this app is a great companion for iPhone and iPad alike. It still gives Apple TVs short shrift when it comes to controlling nonmusic content, but the gesture controller and keyboard make the Remote app much more valuable than its metal cousin.